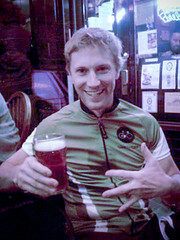 As promised four intrepid BikeHuggers rode last Friday evening. Objectives: Ride for fun, Promote urban cycling awareness for all vehicles – cars and cyclists, demonstrate automobile/bicycle co-existence, and engage in the consumption of nutritious fermented beverages. Good news: Objectives MET. Even more amazing, it was more than just two dudes who showed up! This is positively stunning given the 8 hour notice. Check the Bike Hugger Urban Bikes group on Flickr for more photos. We’ll keep the experiment up, check back for scheduling of future rides. But before we go too far, we’ll need a better name. Hugger input requested! I rolled into Westlake Center about 5:20 and was happily surprised to see the number of cyclists waiting for me: one, which was one more than I expected. Nate saw our post earlier in the day and decided to drop in on our ride. Another hugger (Matt, who initiated the idea) showed up at 6:00 with a friend in tow (Jamie). We 4 cyclemen headed off for some runs through down town shortly after that. We managed to make a reasonable number of loops through down town, briefly swelling our ranks to 6 on two occasions. At one point we hooked up with a couple of friendly and supportive Seattle bike cops who helped demonstrate bike boxing technique. Several commuters joined us briefly (and one pulled us up and over Dexter – what a power house! 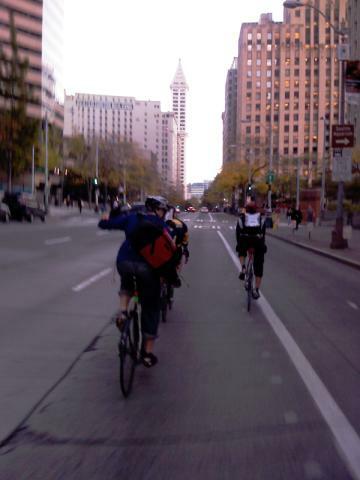 ), and most asked if we were riding Critical mass. Not today, see you in a couple of weeks! More suggestions and votes, please! Next Next post: Does Your Messenger Bag Ever get the “Not so Fresh” feeling?